Harder, Right ? Wrong !" by training smarter, not harder!" What is the 100 Day Marathon Plan? 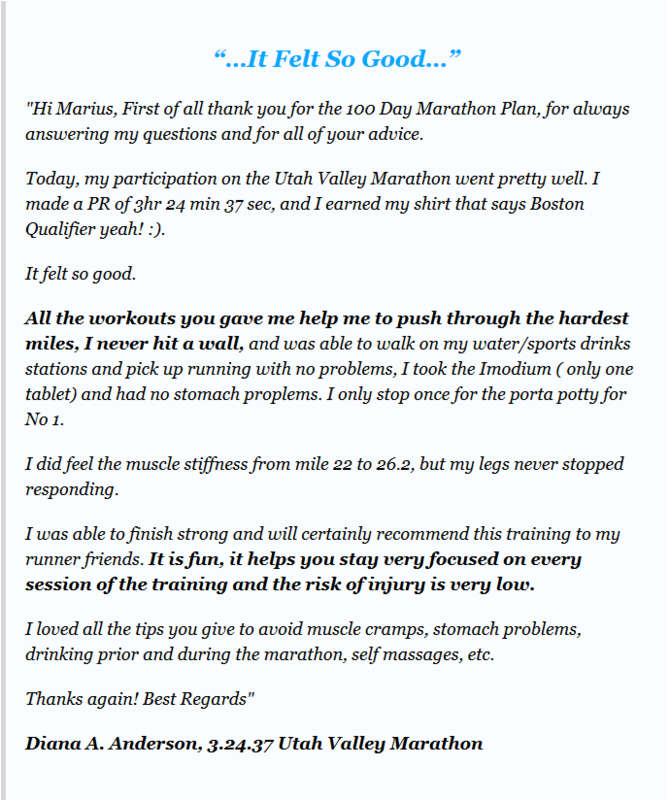 A field-tested and complete training system for the marathon – for both beginners and seasoned veterans by Olympian Marius Bakken, MD. The system is based on a special, highly effective, Kenyan-Italian hybrid training system for smarter training and faster results. Structured so it's easy to customize for any runner — regardless of age, gender, speed, or skill. The entire program comes in easy-to-find sections that clearly explain things. 15 instructional videos walk you step-by-step through the schedules by Marius Bakken. 10 additional videos cover important things like how to pick the correct running shoes... how to improve your running form... how to use strength training... With added advice on proper diet and preventing and healing injuries. There's 8 different marathon training schedules ranging from the pure beginners training plan up to the 2:45 marathoner. Specifically you have a 2:45 schedule, a 3:00, 3:15, 3:30, 4:00, 4:30, 5:00 and a pure beginners plan to pick from ! (you get instant access to all upon purchase) It doesn't matter what level of runner you are. It doesn't matter how fast you currently run. The “100 Day Marathon Plan” can quickly and easily be customized to your needs and abilities. 120 content-packed pages designed to make you run faster and better than you've ever done before. 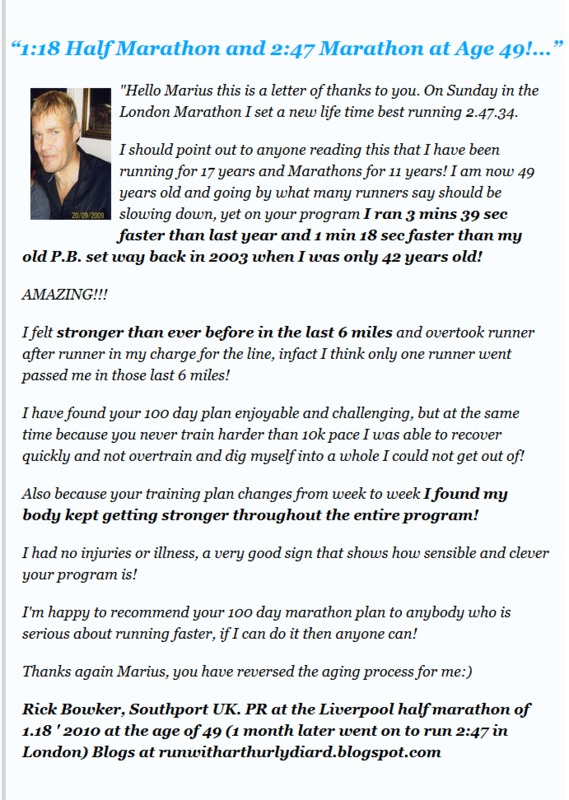 With Faster Results, More Motivational Running and The Most Modern Training You'll Find...	Is It Any Wonder the 100 Day Marathon Plan Is Trusted by So Many Maratoners and Running Experts? "Marius Bakken has used his unique experience as a world-class runner to put together one of the most comprehensive marathon products I have seen. The 100-day Marathon Training program is covering all topics to improve as a runner. "Most marathon schedules are rigid. 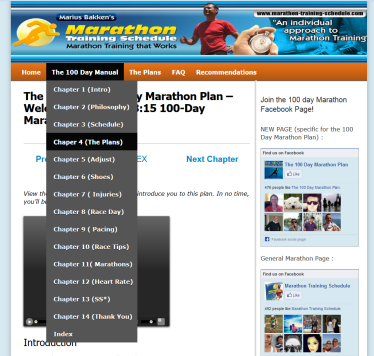 The 100 Day Marathon Plan deals with flexibility and gives runners options. I especially enjoyed the marathon race-day tips and how you combine the Italian and Kenyan schools of thought into one program. I like the use of Lydiard-like periodization with a build up from the 5K to the marathon itself. All types of runners would benefit from this type of marathon work. That's the best thing about this program: It's for everyone! It builds you up for the marathon, step-by-step instead of getting you to think about the marathon from day one. I've never seen anything like this before"
Mikko Jarvinen, two time P.R. 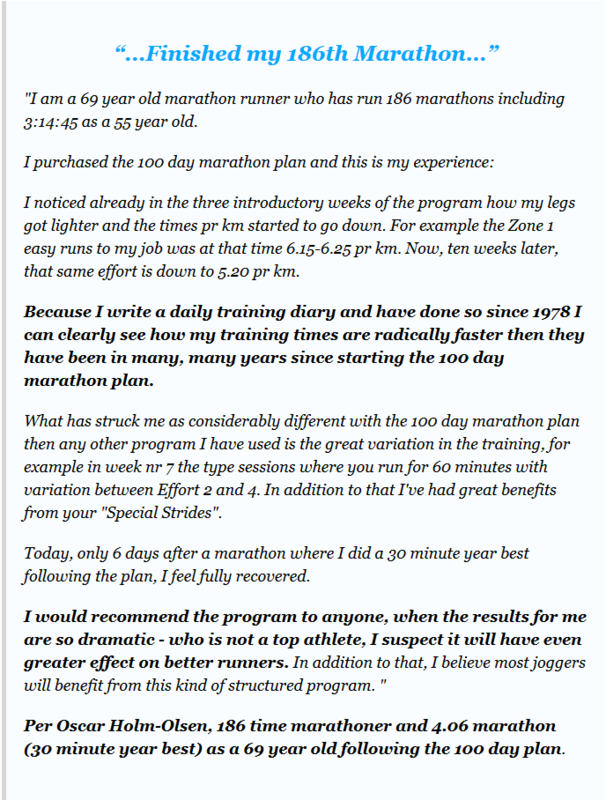 I'm so absolutely sure that the 100 Day Marathon Plan will help your marathon running that I'm offering an unconditional, NO-question-asked 60-day money back guarantee. If for whatever reason the 100 Day Marathon Training Schedule does not satisfy you in any way, simply send me an email within 60 days from your purchase and I'll refund you right away. 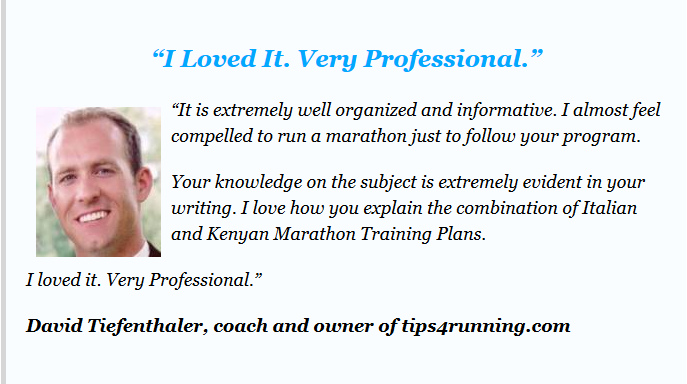 There's eight different training schedules ranging from the pure beginners training plan up to the 2:45 marathoner. Specifically you have a 2:45 schedule, a 3:00, 3:15, 3:30, 4:00, 4:30, 5:00 and a pure beginners plan to pick from ! (you get instant access to all upon purchase ) So you see, it doesn't matter what level of runner you are. It doesn't matter how fast you currently run. The “100 Day Marathon Plan” can quickly and easily be customized to your needs and abilities. Why is the 100 Day Plan Different Than Other Programs ? The 100 Day Plan is based on a special Italian-Kenyan hybrid system. This unique system is what many of the top marathoners in the world currently use. 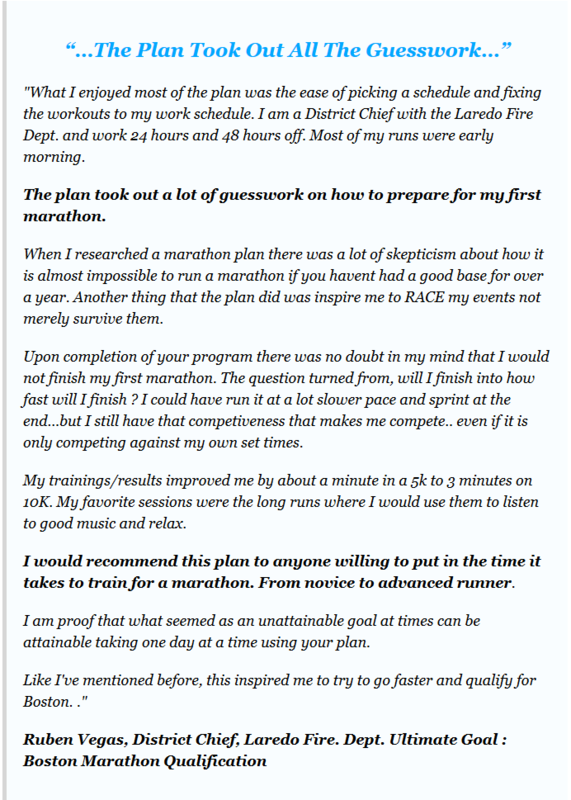 The 100 Day Marathon Plan is a modification of these principles, to fit runners on all levels. The result is smarter training, and better results. This involves clear periodization, where you go through different specific periods in your marathon preparation - to avoid the plateau effect and very varied sessions where no workouts are the same, building you up for the marathon week after week. This approach is not only more effective, but also much more motivational. Is the 100 day Plan Flexible ? I decided to call it the “100 Day Marathon Plan” because the average length of time many experienced marathoners use to train for their next marathon is 100 days. That doesn't mean 100 days is the only option. Not at all. In fact there is added a whole section in the program which explains how you can adjust the program to as little as 60 days or up to 150 days from race day and still use the powerful training. The 100 Day Marathon Plan is a 100 % online system, to ensure you receive free updates and new content that is being added. Upon purchase you'll receive a personal username and password, to gain access to all the plans, videos and content. 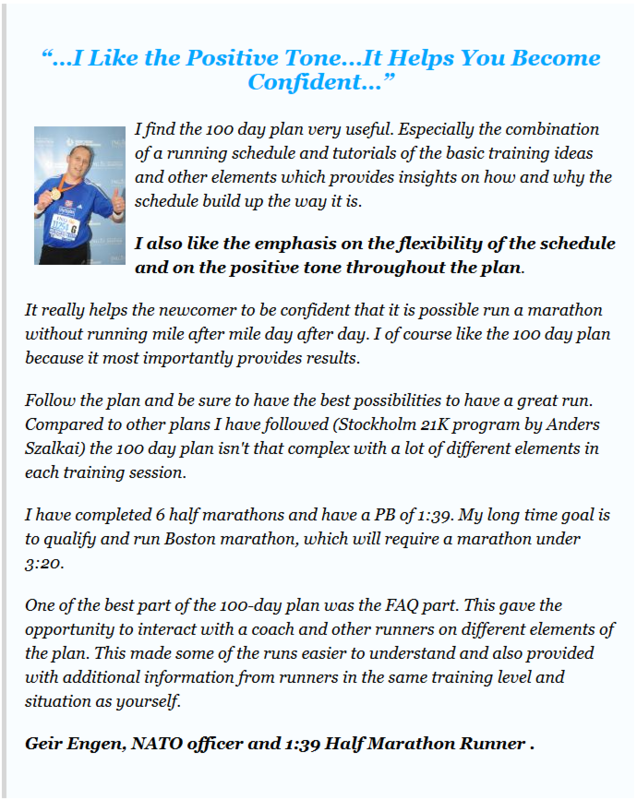 Can I Also Use the 100 day Plan for the 5/10k/Half Marathon ? Yes. In fact, there is a full section in the Members only FAQ on how to adjust the plan to other distances as well. You can even use the 100 day plan as a general running plan, just to improve your general running times and give you more motivational daily running! 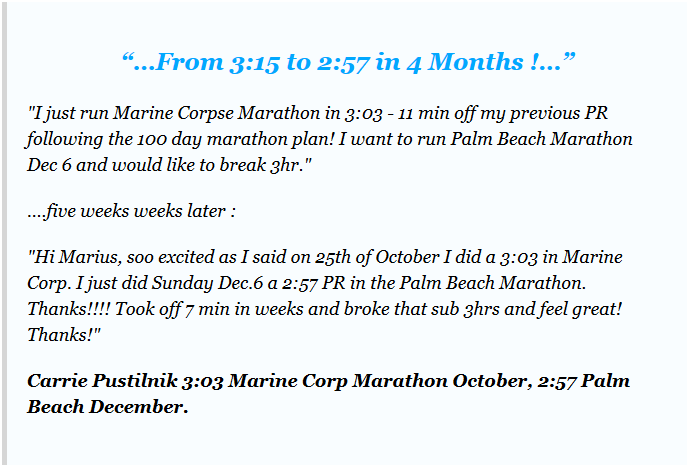 What does the 100 day Marathon Plan Members Section Look Like ? Marius Bakken is a Norwegian two time Olympic runner (2000 and 2004) that currently holds the Norwegian 2000,3000 and 5000 meter record (13.06.39). 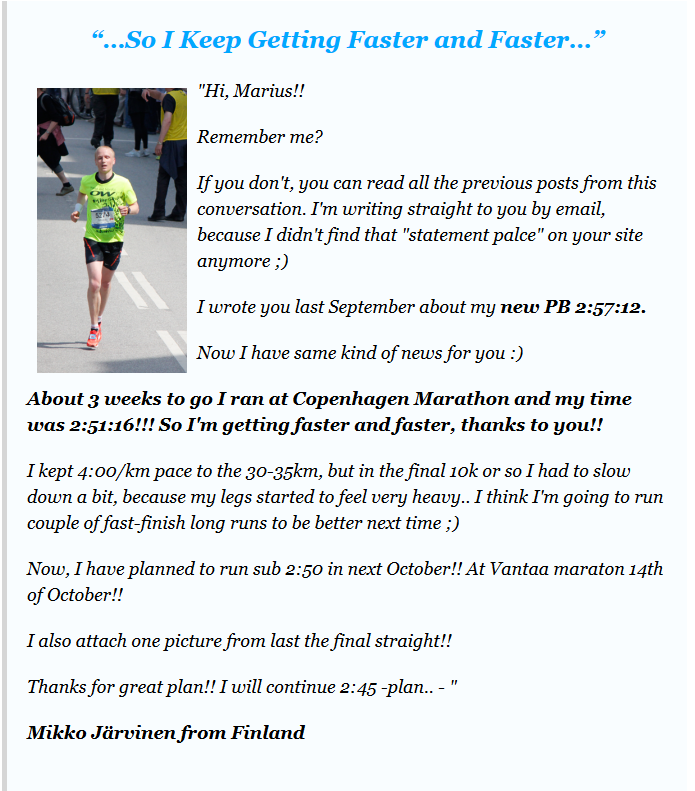 In 2010, he finished medical school and is currently working full time as a doctor in southern Norway, as well as helping the over 3600 runners who have currently gained access to the 100 Day Marathon Training Schedule (as of august 2013). Sign up to today, get instant access and release your full running potential!